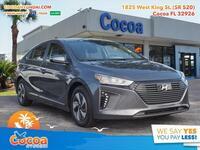 As if the Hyundai Sonata Hybrid wasn’t enough of a power player in the hybrid sedan market, this year Hyundai introduced the Ioniq Hybrid as a direct competitor for the Toyota Prius, the pioneer of hybrid technology. We thought we’d show you just how well this new hybrid sedan fares against the icon, by pitting the 2017 Hyundai Ioniq vs 2017 Toyota Prius in a side-by-side comparison. 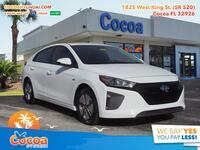 You can take a look at the table below for exact specifications, and we go into further detail below that on exactly what kind of advantages the 2017 Ioniq has over the Prius. 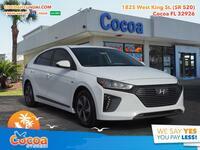 Interested in a 2017 Hyundai Ioniq Hybrid? 26.5 cu. ft. Cargo Capacity 24.6 cu. ft.
We thought we’d work our way right through the table, which in particular takes a look at fuel efficiency and space. One might think that the Toyota Prius, the pioneer of hybrid vehicles, would be more efficient than a hybrid vehicle that’s essentially brand-new, but they’d be sadly mistaken. The first row shows that the Hyundai Ioniq can travel 3 extra miles per gallon through city streets, and a whopping 9 extra miles on the highway. Those numbers translate to some pretty impressive savings at the pump over time. As for space, which is important regardless of vehicle type, the Ioniq keeps up its advantage. In the trunk, the Ioniq offers nearly 2 whole extra cubic feet of space for luggage or whatever you need to bring along, an in the cabin exactly 5 cu. ft. of extra space for you and your passengers to stretch out and get comfortable. If these four impressive specifications are enough to convince you, be sure to schedule a test drive right here on our website. Otherwise you can browse our blog or give us a call to find out more!